As it turned out, not only we and you are able to make errors, but the employees of big and powerful companies too. Thus, yesterday Activision - the publisher of many projects, including Call of Duty game series, - sent an e-mail, which contained the names of 4 Call of Duty: Ghosts DLCs, to one of the game’s fan by mistake. Naturally, the note was immediately removed, but the most lucky gamers managed to take a screenshot of the poster, which they shared with the public. According to the picture, this year the project’s developers are going to release 4 game’s add-ons, which includes lots of cool items for the multiplayer. Their names are Onslaught, Devastation, Invasion and Nemesis. If we add up the first letters of the each pack, we will get the word ODIN, which is written on the background of the poster and is identical to the name of the space station in CoD: Ghosts world. We don’t know what this abbreviation means, but we hope that in the near future the project’s publisher or its developer will explain the sense. 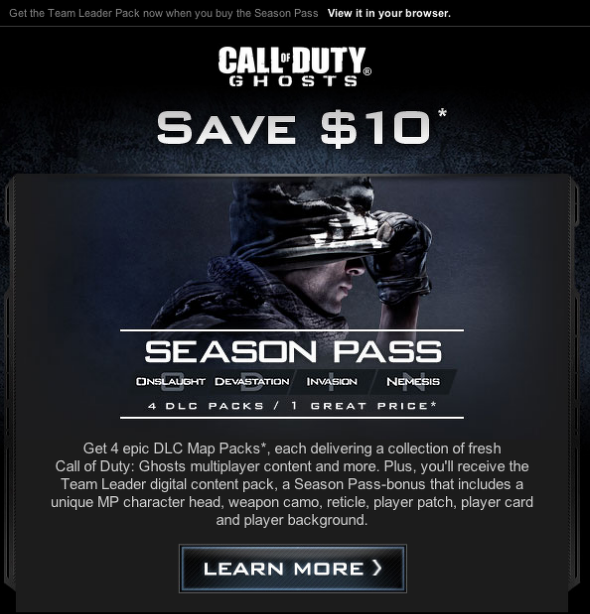 In addition, and again according to the screenshot, all four Call of Duty: Ghosts DLCs are included in the Season Pass and if you buy it, you will not only save $10, but also get Team Leader pack, which includes different interesting items for your character and you as a player. Although CoD: Ghosts DLCs names were leaked yesterday, but at the moment neither the project’s publisher nor its developer has reported anything about the alleged add-ons, and therefore we have to wait for an official statement and believe that all the abovementioned information is true.